The Pomeranian is a small bundle of fur that is energetic and loves to perform tricks. The origins of the Pomeranian are sled dogs of the Spitz type from Greenland and Lapland. They were brought to Pomerania by the Baltic Sea where, with selective breeding that decreased the size of the dog, we have today’s Pomeranian. What does the Pomeranian look like? The Pomeranian’s head is wedge-shaped with a fine muzzle. 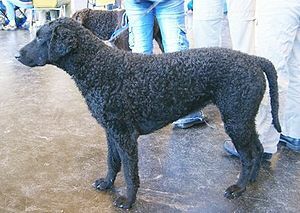 Height is 7-12 inches tall and weight is about 3-7 lbs. 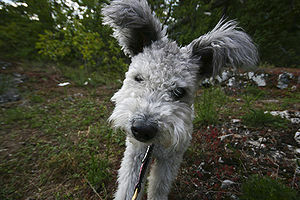 Ears are small and erect, eyes are oval and dark brown. The bushy tail lies flat and is carried straight over the back. 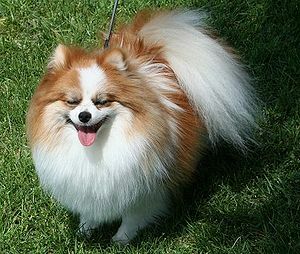 The coat is hard, straight and long making the Pomeranian appear like a ball with a head and legs,which have shorter, softer hair. Colors are orange, white, brown and black. What is the Pomeranian’s temperament? The Pomeranian is a highly intelligent, friendly, energetic fun-loving dog. The Pom trains easily and housebreaking does not present a problem. The Pom gets along with other pets and children who handle it gently. The Pom learns tricks readily and loves to perform. It does well in apartments but do need a daily walk. 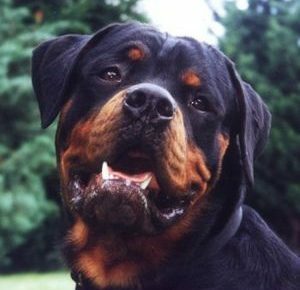 Because of the heavy coat, care should be taken in hot weather to be sure it has a cool spot to relax in. What are the Pomeranian’s uses? The Pomeranian makes an excellent watchdog. Most of all the Pom makes a loving and very loyal companion.